If you watched all of Titans’ debut season—as in, all the way to the very end—you already know the team was likely to gain a new member. In an after credits scene that was easily on par with the best big screen ones, a faceless Superboy was seen breaking out of CADMUS, Krypto in toe. 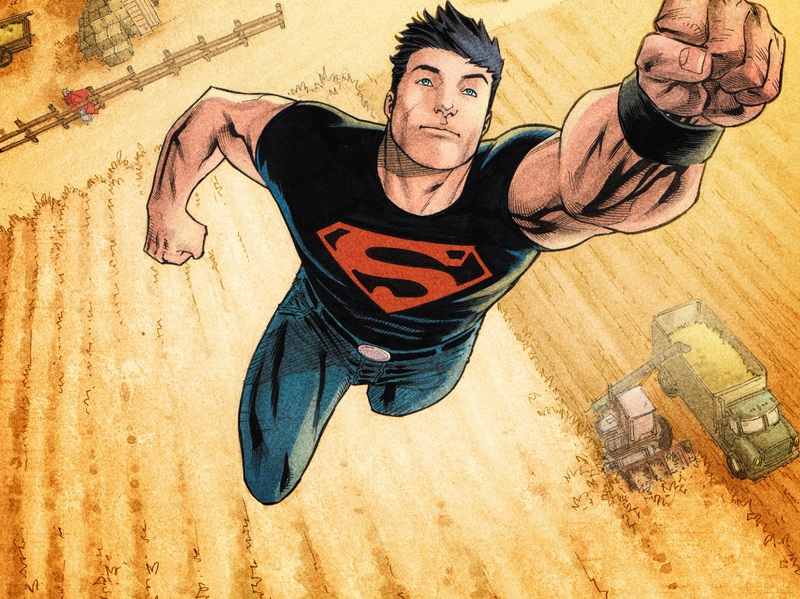 According to the show’s official character description, Superboy, aka Conner Kent, is the angsty teenager of steel searching for purpose and the truth about his past. While looking for answers, he crashes into the world of the Titans where he finds an unlikely home and surrogate family as well as revelations that carry more complications than he ever bargained for. Superboy’s comic book history reflects his life—they’re both very complicated. More than one hero has used the Superboy name, and all of them are currently still active in the DC Universe. (For a brief primer, check out this article about it that ran as part of last year’s ACTION COMICS #1000 celebration.) But for a certain segment of fans, Superboy IS Conner Kent—the rambunctious, often troubled clone of Superman. Conner Kent was introduced in 1993 in the aftermath of THE DEATH OF SUPERMAN. One of four newly risen “Supermen,” Conner ultimately proved to be heroic, despite possessing human DNA from Lex Luthor as well as his Kryptonian DNA from Kal-El. He’d go on to fight alongside the Man of Steel as Superboy after his return and was one of the founding members of Young Justice, a team that has recently returned to the DC Universe along with Conner. Of course, thousands of DC fans worldwide were likely first introduced to the brooding hero in the animated series of the same name. A popular character on Young Justice throughout all of its seasons—including the in-progress Young Justice: Outsiders—Conner’s central role on the series has arguably made him the most well-known Superboy among fans, though its unclear how similar Titans’ take on the character will be to Young Justice’s (the fact that he’s described as “angsty,” however, suggests some common ground). Traditionally, Conner Kent has similar powers to Superman’s, but they’re not always an exact match. In the comics, Conner’s powers were initially derived through a form of telekinesis known as “tactile telekinesis” that allowed him to simulate most of Superman’s abilities, as well as project psychic blasts and render an opponent immobile. On Young Justice, Conner derives his powers from the sun, but lacks heat vision and the ability to fly. In short, Titans will have plenty of wiggle room when it comes to building Superboy’s power set. As for Orpin, he hasn’t yet been seen much in the States, but he’s an upcoming stage and screen actor in his native Australia, having appeared in shows like The Blake Mysteries: Ghost Stories, movies like The Neon Spectrum and plays such as The Tempest and A Midsummer Night’s Dream for The Australian Shakespeare Company. Okay, DC fans. Now it’s your turn. What do you think about this news? Did you catch season one of Titans? Will you be checking out season two? Make sure you’re subscribed to DC Universe so you don’t miss out on Superboy on Titans, as well as other amazing current and upcoming DC Universe originals like Doom Patrol, Swamp Thing and Stargirl!